Does urban living threaten our sanity and happiness? Popular culture is rife with stories which suggest that living in a city increases loneliness and unhappiness, and some scientific studies indicate that urbanization increases mental illness and depression. Are these claims credible? How can communities maintain mental health and happiness? These are important and timely questions. The human experience is increasingly urban; transitioning from rural to more urban areas. Decision-makers and individuals need practical guidance on how to maximize sanity and happiness when planning cities and choosing where to live. A newest report from Todd Litman, “Urban Sanity: Understanding Urban Mental Health Impacts and How to Create Saner, Happier Cities,” examines these question. It indicates that city living has mixed mental health impacts. Overall, this research found little credible evidence that urban living significantly increases overall insanity or unhappiness and lots of evidence that most people are, overall, mentally better off living in compact, mixed, walkable urban neighborhoods. Scientific studies which indicate that urban living increases mental illness and unhappiness tend to be incomplete and biased; they consider a limited population and fail to account for important confounding factors. In this regard, they cannot differentiate between association (cities attract mentally ill and unhappy people) and causation (cities make people mentally ill and unhappy). There is plenty of empirical evidence that most people are happier living in cities, including huge worldwide rural-to-urban migrations; these would not occur if billions of people did not consider themselves overall better off in urban conditions. Some consumer surveys indicate that, given unlimited resources, most households would prefer a large suburban home and automobile commuting over an urban apartment and public transport commuting; in fact, if resources were unlimited, most would probably prefer a castle located in a private game reserve and commuting by helicopter, but when confronted with realistic trade-offs, a major portion of households will choose compact urban housing. Much of the evidence that consumers dislike cities, and that cities increase mental illness and unhappiness, are specific to North American conditions, where public policies are anti-urban and cities have severe social problems. As a result, such evidence does not apply to economically successful, well-designed urban neighborhoods. 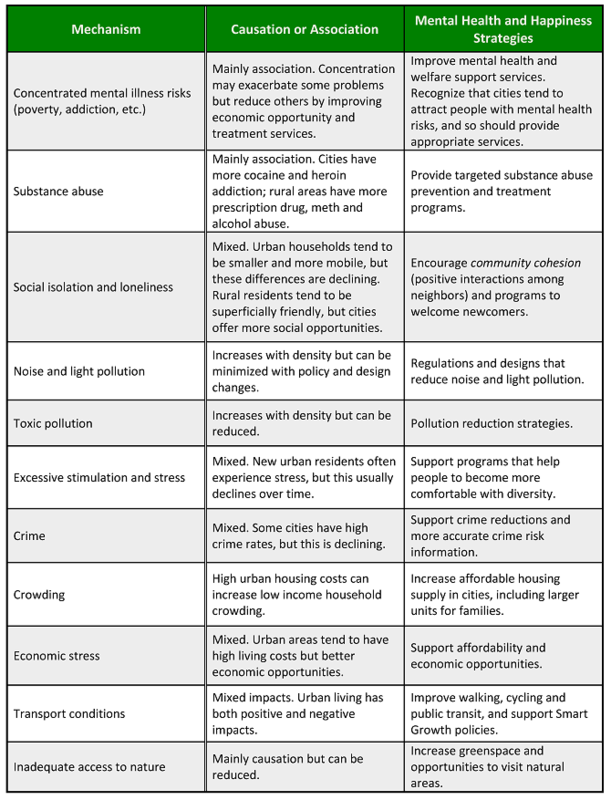 The table below summarizes various mechanisms by which urban environments can affect mental health and happiness, considers whether these are actually caused by urbanization, and identifies specific response strategies. 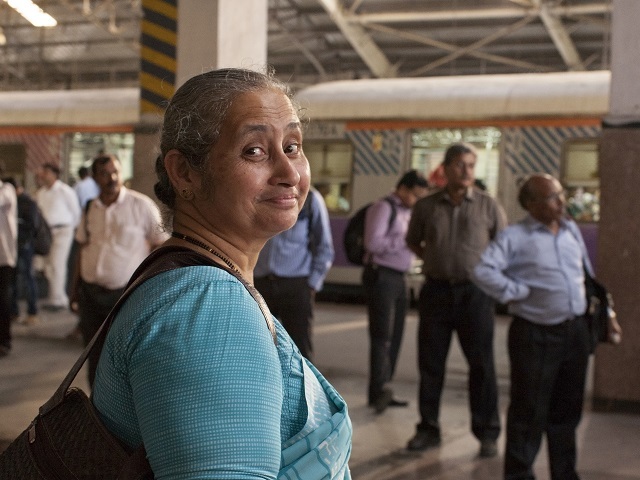 Urban living can affect mental health and happiness in several ways. Some are inherent to urban conditions, but many are associations related to confounding factors. This analysis suggests that better policies and design strategies can increase urban mental health and happiness. These include policies that improve mental health services in urban areas, more affordable urban housing and transportation, improved walking and cycling conditions, improved social programs that integrate visible minorities and welcome newcomers into urban neighborhoods, and appropriate public parks and recreation facilities. Such policies are important in both developed countries, where public policies currently favor suburban over urban living, and in developing countries, where rapidly developing cities can incorporate design features to maximize mental health and happiness. This is not to suggest that everybody should live in dense cities; some people are unsuited due to their lifestyle or temperament, for example, because they own large pets or engage in noisy activities. However, because cities tend to improve economic and social opportunities, many people benefit overall from urban living; their economic and social gains more than offset any additional mental stress, particularly over the long run, as they become accustomed to urban environments. Since urban living reduces per capita land consumption and transport costs, it tends to provide additional, indirect benefits. Urban planners should find this research reassuring; it suggests that most people can take advantage of urban living benefits without sacrificing their sanity or happiness. Good urban planning can help create saner and happier cities.